For years my mom hosted a Christmas Eve open house. It was always one of my favorite parties - dinner of appetizers, great company, chocolates, cookies, wine and lots of candles. Some years my mom would get a big ham and we would all make little sammies or just peel off and eat delicious ham. When everyone left and the food that needed to be put away was wrapped up and the candles were melty and low, we would start make Christmas Eggs. The next morning, we would make coffee, take the Christmas Eggs out of the fridge, warm up the oven and open stockings. When stockings were done, we'd eat our Christmas Eggs and gear up for the next round of presents. It's a Christmas tradition I am keeping! Christmas Eggs are basically a breakfast casserole. It's super easy to put together the night before and bake on demand the next morning. Grease the bottom of a 9x13 (or similar sized baking dish) with 1 tablespoon of butter. 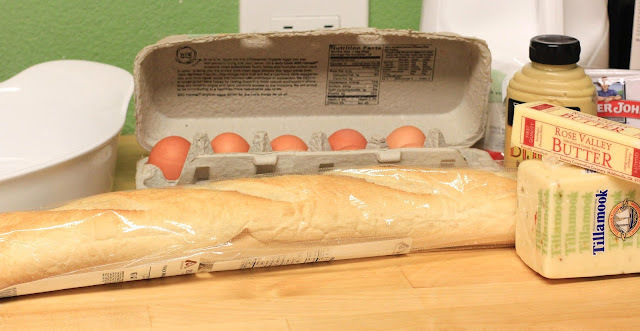 Roughly cut up the French bread or tear into pieces and scatter them in the baking dish. Cube the ham, grate the cheese and scatter these over top the bread pieces. Whisk the eggs, milk, mustard, salt and pepper until eggs are fully whipped and the milk and mustard are totally incorporated, about 2 minutes. 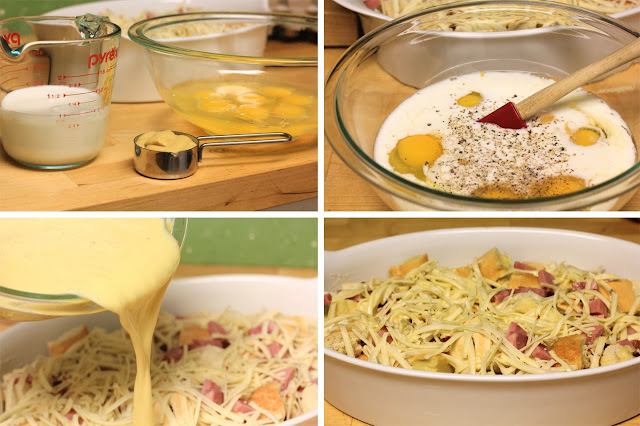 Pour the egg mixture evenly over the bread, ham and cheese. Cover and store in the fridge overnight. 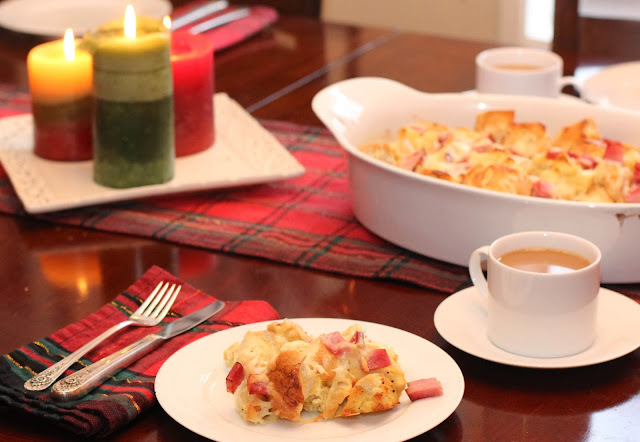 The next morning, take the Christmas Eggs out of the fridge and preheat the oven to 350. Bake uncovered for 35-45 minutes, until the edges are browned and the egg is fully cooked. You should be able to see cooked egg between the bread pieces. Serve hot. It has to sit and soak in for a while. Overnight works really well, but if you like breakfast for dinner, assembling in the morning and cooking for dinner is great too. If you don't like pepper jack, sharp cheddar is a great substitute. I like to add a pinch of red pepper flakes if I use milder cheese. I used plain French bread this time, but a jalapeno cheddar loaf is awesome! I've brought this to lots of brunches. I've baked this in ramekins for individual servings. I've doubled the recipe, I've cut it in half. This is wonderful. If you don't like ham, don't use it.